Greg Belson is a veteran DJ and one of the premiere collectors of soul music worldwide. He’s known as the go to authoritarian for Gospel Soul music, is the compiler of the Divine Disco series on Cultures of Soul and presents his radio broadcast Divine Chord Gospel Show on LA’s dublab.com creative hub. and Paulo Fulci is a DJ and producer out of Bristol UK. His work as part of the Situation edit crew has been released and supported as part of the underground for many years….he now spends his days slangin’ records, whilst honing his disco scalpel skills in the late twilight hours. 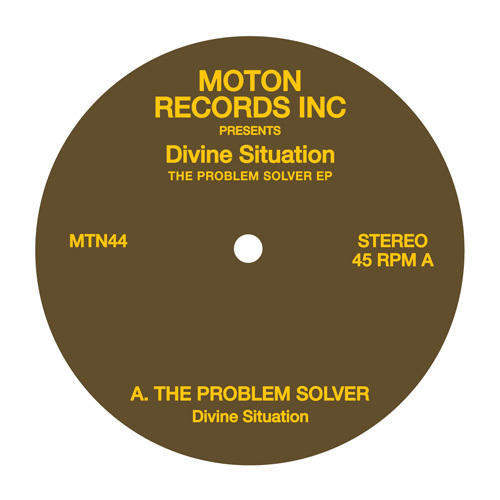 Following on from their incendiary slab of two sided gospel goodness ‘Born Again’ & ‘Soul Revival’, the Divine Situation duo have crafted the next lot of bangin’ spiritualized dancefloor destroyers for your record box. Here we have an EP catering for several sides to your night. The lead off cut is the flat out roof raiser ‘The Problem Solver’…..then it’s boogified territory with ‘Brand New Feelin’, before they close out with the end of ‘nighter, ‘Try Love’. Once again, Moton bringin’ the heavyweight platters that matter!